My entire career has been spent singing the praises of beneficial aerobic organisms, in the soil and on the leaf surface. Anaerobic bacteria were always the putrefying organisms that can develop in the absence of oxygen. They were the undesirables, generating unpleasant smells in compacted, neglected soils and mismanaged compost. One of their exudates, called butyric acid, smells like vomit while another, called hydrogen sulfide, resembles rotten eggs. Both substances are toxic to plant growth at very low levels. Over recent years, I have increasingly encountered the use of different, non-pathogenic groups of anaerobes, which can offer profound benefits in the soil, on the leaf, in manure pits, in composting, when bailing high moisture forage crops, and as an animal probiotic. These organisms ferment rather than putrefy, and they offer a truly impressive suite of outcomes. In fact, I now feel that they are essential tools in the biological armoury. Lacto-fermentation has been a food preserving strategy in multiple cultures for centuries. Those that have intensely embraced this technology include the longest living peoples on the planet. Lacto-fermented food is said to be vastly superior when compared with the same food that has not been pre-digested. Nutritionists suggest that all of the nutrients found in fermented food are around five times more effective. Trillions of Lactobacilli inhabit every leaf surface and every soil, and there are no accidents in the perfect blueprint. If these organisms are so ubiquitous, there must surely be a compelling rationale for their presence. Well, it turns out that there is, and it represents a wonderful opportunity for farmers, graziers, gardeners, and horticulturalists everywhere. Nobel laureate Élie Metchnikoff first suggested the possibility of colonising the human gut with beneficial flora in the early 20th century. However, it was not until seven decades later that a Japanese Professor, Teruo Higa, inspired by the findings of his colleague, Dr Kobayashi from Kyoto University, kick-started the anaerobic revolution in agriculture. He initiated research that eventually led to the development of the first commercial anaerobic blend. Variations on that theme have sprung up across Asia and South America. The movement has been more pronounced in subsistence agriculture because it is user-friendly and low-cost, and these societies were also less enamoured with the Western, chemical, extractive model. I am convinced that it is high time that this remarkably productive strategy was more widely accepted by the modern agricultural machine. There are no other single options available that can reduce chemical and fertiliser requirements, increase humus, cleanse water holes, sanitise sewerage, spark animal health and performance, improve the nutrient value of animal feed, and dramatically improve the sustainability and potential of composting. 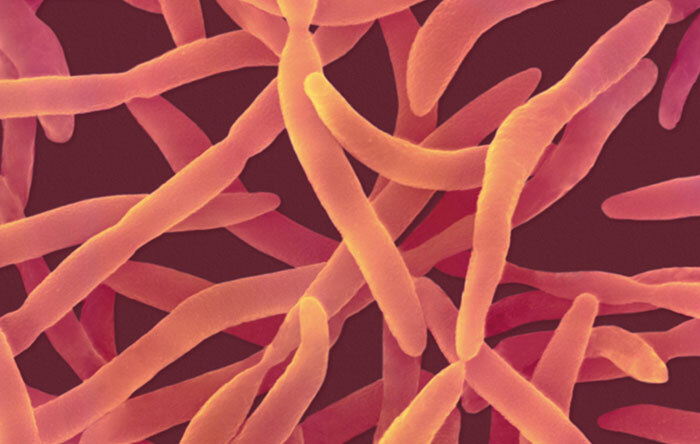 These microbes involve multiple strains of Lactobacillus. Interestingly, these include many of the strains found in our best-selling probiotic drink, Bio-Bubble™. Lactobacilli are found in the gut and on the skin of all living organisms. They are found in every soil and on every leaf surface and their abundance signals their importance. However, it was only when Professor Higa began researching their roles that we began to grasp their profound significance and exciting promise. Just as lacto-fermented food remains pathogen-free, the lactic acid in the soil appears to help keep disease organisms in check. The key to the success of our new product Nutri-Life BAM™ is the synergistic nature of this blend of specialist anaerobes. The other major group of beneficials in BAM™ includes a unique group of photosynthesising bacteria called Purple Non-Sulfur Bacteria (PNSB). These organisms can operate on the phyllosphere (leaf surface) and the rhizosphere (area around the roots). In the soil, these organisms have been shown to boost the metabolic activity of other beneficial bacteria, while stimulating root growth. On the leaf surface, they excrete phytohormones and enhance the activity of multiple phyllosphere species. These particular organisms have been used as bio-fertilisers for many years in Korea and China, but their mode of action has not been intensely studied until recently. They are self-supporting organisms that produce sugars to stimulate other soil life. They can also build amino acids for the benefit of plants and other organisms. Some researchers have suggested that PNSB generate carotenoid pigments (antioxidants), co-factors (substances that stimulate other organisms) and plant secondary metabolites to promote plant growth. They provide sunlight and UV protection. They are antibacterial, and antifungal. Induced systemic resistance – boosted plant immunity. They can either repel or attract herbivores, depending on plant intent. They can inhibit growth of competitive plants. They can increase tolerance to extreme weather events (critically important as climate change bites). They can better attract seed disseminators and pollinators. They increase photosynthetic potential and plant vigour. This suite of supportive substances offers profound benefits to plants and the microbes that sustain them. In a recent Chinese study involving PNSB fertigated and foliar sprayed on stevia plants (the source of a popular natural sugar substitute, called stevioside), there were substantial results. Chlorophyll density increased, sugar levels increased, biological activity on the leaf and in the soil was enhanced and the yield of stevioside increased by an impressive 69.2%. Let’s take a closer look at the composting story, as it is dear to my heart. Composting is an essential strategy for averting global warming, as it stabilises carbon that would otherwise have entered the atmosphere, thickening the blanket and trapping the heat. However, the regular use of compost introduces more to your soil than a source of stabilised carbon. Compost delivers billions of cellulose-digesting organisms to biologically compromised soils to reclaim their humus building potential. All composting is of immense value. However, there are some question marks about windrow composting, the most popular commercial composting strategy. Here, the compost is turned multiple times involving a substantial, often unrecognised, carbon footprint. Each turning involves a loss of carbon to the atmosphere, as CO2, through oxidation. Nitrous oxide (310 times more thickening of the greenhouse blanket than CO2) can also be lost during this disruption. The pile is dried out when turning, so much more water is required, and this can leach unstable minerals before they are stabilised by humus. Finally, the potential for creating a highly desirable fungal-dominated compost is seriously reduced when we slice and dice their hyphae with each turning. The reintroduction of a fungal workforce in our soils is a global warming imperative because these are the creatures that digest crop residues and produce stable humus, with a soil-life of 35 years. These cellulose-digesting fungi are the creatures most missing in the majority of soils, as they have been decimated with fungicides, herbicides and nematicides. Aerobic composting can be labour intensive and it can involve expensive machinery. Time starved farmers will often resist what they see as "another job" in the face of these challenges. Ideally, we need an option where the composting process is so simple, it becomes much more appealing to become involved. Then, there is the secondary issue of the conversion rate from organic matter to compost. Due to the loss of organic components during aerobic composting, the conversion rate of organic matter to completed compost is not good. Often, you can expect just 650 kg of compost from every tonne of composting materials. If there is a better way, then it should be explored. 1) Minimum effort – the compost heap can be constructed within a few hours (depending on size) and then it is usually never touched again. 2) Much greater conversion rate – the conversion rate is typically over 900 kg per tonne of organic matter. There is no loss of CO2 or nitrous oxide and there is no nutrient leaching or excess water requirements. 3) Compost in half the time – the compost is completed within 2 months, as compared to 4 – 6 months with aerobic composting. 4) Smaller carbon footprint – there is a much smaller carbon footprint because the ongoing machinery requirements and carbon losses associated with windrow composting are avoided. 5) No biological disruption – this compost is never turned, so there is no damage to beneficial biology. The organisms flourish when undisturbed. 6) Smell-free, fly-free composting – sometimes composting components, like manure, can smell strongly and attract flies. BAM™ anaerobic composting happens under airproof covers. There is no smell or flies. 7) Powerful earthworm stimulant – BAM™ compost has a remarkable effect upon earthworms. Often they will invade the pile and they arrive from everywhere when the completed compost is applied to the soil. 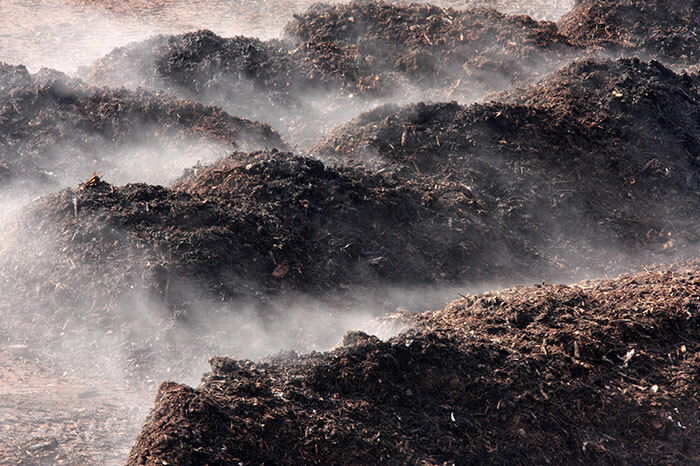 Your BAM™ compost pile is constructed layer by layer, just like an aerobic compost. The "carbon" layer (straw, mulch, woodchip etc) should be at least 20 cm deep, followed by a "nitrogen" layer (green waste, animal manure etc) of the same depth. Lime, friable clay, soil and perhaps a little molasses is sprinkled on each of these layers before they are individually wet down. Immediately prior to the "wet down" process, BAM™ is diluted and applied to each layer at a rate of 1 litre per cubic metre of organic matter. The subsequent hosing down of each layer will carry the applied inoculum throughout the mix. Upon completion of this layer cake, the 2.5 – 3.0 metre pile is completely covered by an air-proof tarpaulin, or specialist compost cover. Typically, concrete blocks are positioned on the base of the cover and tightly roped to corresponding blocks on the opposite side. This web-like network of ropes effectively keeps the cover tightly fitted and the pile free from oxygen. In this manner, the essential anaerobic conditions are created. Two months later, the pile should be checked and, typically, the composting process will be complete. Beneficial Anaerobic Microbes (BAM™) can be invaluable problem solvers in the soil and on the plant. They can enhance nutrient uptake, exclude unwanted pathogens and rapidly convert stubble and crop residues into humus. During their multiplication, they exude a range of supportive substances, including plant growth promoters. They are renowned for their capacity to stimulate existing beneficial soil life, including earthworms. Trials at NTS have demonstrated a huge potential yield increase from soil or foliar applied BAM™. 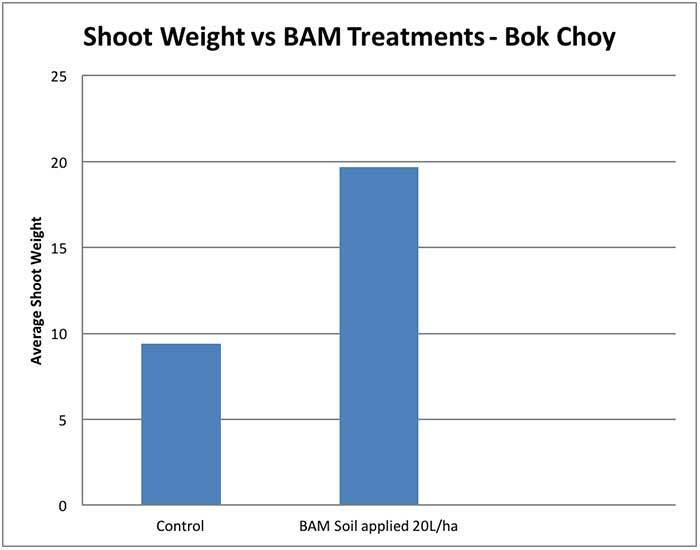 Six weeks after planting Bok Choy treated with BAM™ had double the shoot weight compared to the control. The problem solving potential of "drench to drip-off"
During a recent seminar tour of Western Australia, I dined with a consultant who had spent two decades working with similar beneficial anaerobes in Asia. He shared many experiences and multiple photos of his successes using specific application techniques that we had never researched during our trial work with BAM™. Working in a diverse range of crops from vegetables to orchard crops, he has had greatest success with an application strategy involving drenching the foliage, stem (or trunk) and the immediate soil around the plant, with a very dilute application of beneficial anaerobes. He drenches each crop to drip-off with a 1:500 dilution. This might be repeated once a month for fruit crops and more frequently with field crops. I marveled over photos of 6 kg pawpaws and previously abandoned mango orchards that had been dramatically resurrected with this strategy. Diseased trees and unproductive orchards that were destined to be pushed out were now groaning with massive fruit loads. This accomplished consultant claimed he had rarely had a failure with this strategy and he had witnessed successful management of multiple problems when applying the anaerobes to drip-off. We have just made up a spray unit to enable the trialing of the "drench to drip-off" concept on our research farms. This involves a 1000 L shuttle that has been plumbed to accommodate a 5 hp pump and a spray wand with 10 metres of hose. BAM™ is added to a 1000 L tank of water, at a rate of just 2 L per 1000 L. The wand will allow rapid spraying to drip-off and the brief hosing of the root zone. Stagnant manure ponds are the bane of many dairy farmers. In many countries, this waste stream cannot be applied to pastures because of an unstable mineral content. The nitrate nitrogen component can contaminate waterways and phosphorous can spark algal blooms. The addition of BAM™ to manure ponds can transform putrid ponds into living liquid fertilisers that are both stabilised and biologically enhanced. These beneficial anaerobes thrive and multiply amidst this stagnation and they effectively convert a liability into an asset. Similarly, sewerage can be transformed. You can pour BAM™ down the toilet to activate your septic tank and avoid problems. The inclusion of beneficial anaerobes into your agricultural enterprise may prove to be one of your most productive decisions in 2017. I can think of no other input with this level of versatility and widespread benefit. Polluted waterways can be regenerated, salt and toxins in the soil can be neutralised, the probiotic impact on leaf surfaces and in the soil is profound, odours can be reduced, pathogens managed, and there is no better way to create a super-productive compost in as little as 8 weeks. 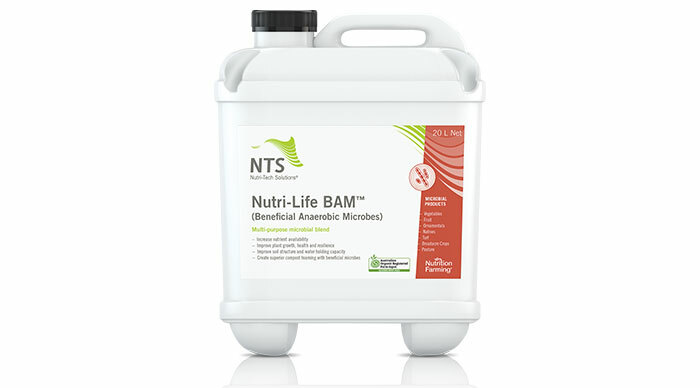 If you have any queries regarding Nutri-Life BAM™, please contact NTS on 07 5472 9900 or email info@nutri-tech.com.au.